Pope Innocent IX (Latin: Innocentius IX; 20 July 1519 – 30 December 1591), born Giovanni Antonio Facchinetti, was Pope from 29 October to 30 December 1591. Prior to his short papacy, he had been a canon lawyer, diplomat, and chief administrator during the reign of Pope Gregory XIV (1590–1591). Giovanni Antonio Facchinetti, whose family came from Crodo, in the diocese of Novara, northern Italy, was born in Bologna on 20 July 1519. He was the son of Antonio Facchinetti and Francesca Cini. He studied at the University of Bologna - which was pre-eminent in jurisprudence - where he obtained a doctorate in both civil and canon law in 1544. He was later ordained to the priesthood on 11 March 1544 and was appointed a canon of the church of Saints Gervasio and Protasio of Domodossola in 1547. He travelled to Rome and he became the secretary to Cardinal Nicolò Ardinghelli before entering the service of Cardinal Alessandro Farnese, brother of the Duke of Parma and grandson of Pope Paul III (1534–1549), one of the great patrons of the time. The cardinal, who was the Archbishop of Avignon, sent Facchinetti there as his ecclesiastical representative and subsequently recalled him to the management of his affairs at Parma, where he was acting governor of the city, from 1556 to 1558. 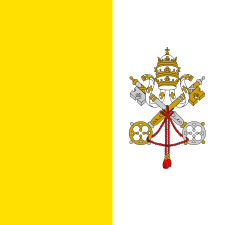 He was also made the Referendary of the Apostolic Signatura in 1559 and held that post for a year. The tomb of Innocent IX. In 1560, Facchinetti was named as the Bishop of Nicastro, in Calabria, and in 1562 was present at the Council of Trent. He was the first bishop to actually reside in the diocese in three decades. Pope Pius V (1566–1572) sent him as papal nuncio to Venice in 1566 to further the papal alliance with Spain and Venice against the Turks, which ultimately resulted in the victory of Lepanto in 1571. He was recalled from Venice in 1572 and was made the Prior Commendatario of S. Andrea di Carmignano in the diocese of Padua from 1576 to 1587. Relinquishing his see to pursue his career in Rome in 1575 and also because of health reasons, he was named the Titular Latin Patriarch of Jerusalem in 1572. He occupied that post until he was made a cardinal. Pope Gregory XIII made him a cardinal on 12 December 1583 as the Cardinal-Priest of Santi Quattro Coronati and he was to receive the red hat and title on 9 January 1584. Pope Gregory XIV made him the Prefect of the Apostolic Signatura in 1591. Even before Pope Gregory XIV died, Spanish and anti-Spanish factions were electioneering for the next pope. Philip II of Spain's (1556–1598) high-handed interference at the previous conclave was not forgotten: he had barred all but seven cardinals. This time the Spanish party in the College of Cardinals did not go so far, but they still controlled a majority, and after a quick conclave they raised Facchinetti to the papal chair as Pope Innocent IX. It took three ballots to elect him as pope. The cardinal protdeacon Andreas von Austria crowned Innocent IX as pontiff on 3 November 1591. He elevated two cardinals to the cardinalate in the only papal consistory of his cardinalate on 18 December 1591. Mindful of the origin of his success, Innocent IX supported, during his two months' pontificate, the cause of Philip II and the Catholic League against Henry IV of France (1589–1610) in the French Wars of Religion (1562–1598), where a papal army was in the field. Death, however, did not permit the realisation of Innocent IX's schemes. 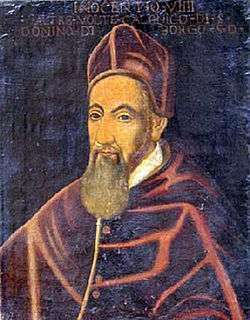 His great-nephew Giovanni Antonio Cardinal Facchinetti de Nuce, juniore, was one of two cardinals appointed during the weeks of Innocent IX's pontificate. 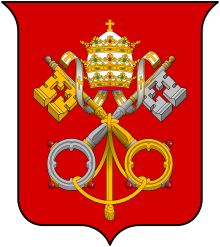 A later member of the Cardinalate was his great-grandnephew Cesare Facchinetti (made a Cardinal in 1643). Innocent IX died in the early morning of 30 December 1591. 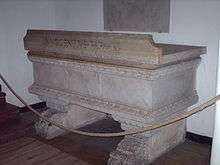 He was buried in the Vatican grottoes in a simple tomb. Wikimedia Commons has media related to Innocentius IX. Herbermann, Charles, ed. (1913). 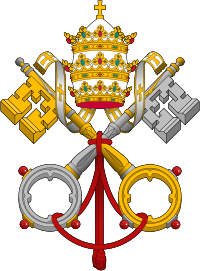 "Pope Innocent IX". Catholic Encyclopedia. New York: Robert Appleton Company.